I am really excited to share with you this book. 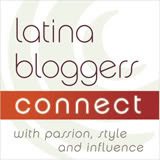 The author Ramona Moreno Winner is a Latina mother, who lives in California with her family and dog. I chatted with her through email, and right away noticed, she is one of a kind. She writes multicultural stories for children, but after reading the story with Jeremiah, I felt she wasn't only sending him the message, but I as well. 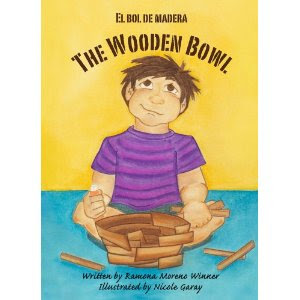 The book Jeremiah and I read is The Wooden Bowl. It is bilingual, which is a great way to get your school age child to read spanish. I first read Jeremiah the story in spanish, and then we went back to read it in english (this makes his reading of spanish more comfortable). The Wooden Bowl is a great story about a young boy, Diego, who notices that his very old grandfather, although loved by his family, is not always treated like an adult. His age has caused him to be messy at the dinner table and accidentally drop or spill things, much like Diego. They exclude the grandfather from the dinner table because of his messiness, and his grandfather is sad and ashamed. Diego teaches his parents an important lesson about respect and remembering how this makes Grandfather feel. His parents realize their behavior and quickly change to make things right. I asked Jeremiah what he learned from the story and I think he sums it up perfectly, "to treat others like I want to be treated". The story is meaningful and I think, a great read for any child. The illustrator is Nicole Velasquez, and her drawings are beautiful. The characters are each so unique and by their different hair colors, kids from many cultures can relate. At the end of the story Ramona includes a discussion page and vocabulary section for you and your child. I love this. 2010 National Parenting Publications Honor Award. Ramona has sent two books for me to giveaway! Do you have your parents living at home with you? How do you feel teach your child to respect elders? Have you read any other of Ramona's books? Leave a comment or question for Ramona (she might be popping in here and there throughout the day), giveaway will end June 11, 2010 at midnight. US entries only. Hope you are having a beautiful start of the week...it's Tuesday already!!! *A copy of The Wooden Bowl was sent to me by the author for review as part of the Bronze World Latino Virtual Book Tours. All thoughts are my 100% my own. I was not given any monetary copensation. Krista: Have the kids take the vocab quiz at the back of the book. You will be surprised at how many words they are already familiar with! To The Proud Mommy: The book also allows you to add photos or drawings on the printed picture frames. This makes a nice gift for a grandparent. This book looks great. We used to live next door to my parents...we might as well have lived with them. I really loved multi-generational living, and my husband and I are considering eventually building a house on their property. Sounds like a wonderful book. I love reading to my daughter and she loves when the books are in Spanish. My parents do not live with me. I love, love, love bilingual books and so do my kids. This one sounds like a great one to add to our book collection. I just wanted to mention to everyone that I found this story with a different twist in the Asian and Mexican cultures. In the Asian version the father makes a woven boat to send the grandfather down river. In the Mexican version, the grandson asks for half of a rug to cover grandfather with. When the father tells the boy to use the whole rug, the boy says he wants to save the other half to for the father when the father is old and feeble. I love to read to my kids and love more when the books are bilingual...we speak spanish and english in my house. I LOOOVE to get bilingual books cause then my husband and me can both read them without having to "inventar" hahaha! Anyways, my mom lives with us, I haven't thought about any special way to teach my kids how to respect the elderly. We just treat her the same as another adult, but maybe it's because I don't feel that she's so old! My husband speaks Spanish and I am only an English speaker. We are taking strides to ensure our 9 month old daughter is bi-lingual. I would love to experience one of Ramona's books! thanks so much for sharing this.. hope you'll share more. i hope to teach la nina spanish in a few years. she loves her books so something like this would be great. We are THRILLED to have her join us to read to the kids.